From bland to beautiful - street appeal needed! 2. The entry. The patio juts out only slightly which is worse than not at all. It breaks the line of the house but doesn't look intentional. 3. The budget. We can do soft work ourselves and minor building, but once any work tips into council approval etc we start to use up funds we don't have. 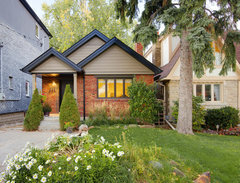 Prior to this, we got a quote on reconfiguring the roofline at the front and it was prohibitive. 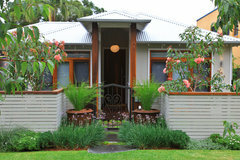 We like contemporary styling for house and garden, not into cottage gardens. Very open to adding some built landscaping such as screens, etc. 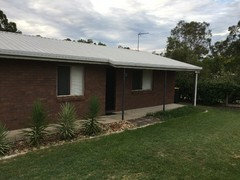 Advice on house and landscaping would be appreciated greatly! Landscape. Spent the money on a designer to come out and do a design. Our's was just $800 for hand drawn sketch's. Doesn't need to be a Landscape Architect just a good designer. I see no major issue with roofline, it is what it is. I've seen some pretty woeful thing's but this quite ok. Maybe some chunky hardwood support post's perhaps? Spend money on maintenance issue's as well, leaking downpipes, poor stormwater control's, broken light fitting's, etc. then landscape. 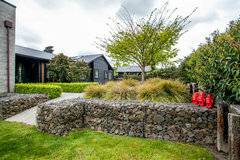 Landscaping & planting. If you add plants of different heights & colours in front of your home it will draw the eye away from the bland front of house, add value and interest and can be done fairly cheaply. Paint your front door your favourite bright colour to draw attention to it and keep and eye out for some sort of large garden art or sculpture for the front wall between the two windows. Love the painting a bright door idea. My go to are the primary colours or red, blue or yellow, but of course- personal choice! Some great ideas, thanks! As for the door, I do like the idea of primary colours but we have a Crimsafe black security door which is discreet, but you wouldn't really see the coloured door behind that. 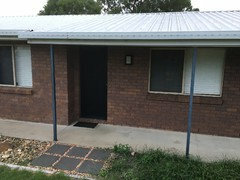 Looks like the front door should be black, any closer photos of this , I don't really see a problem with the roof from your photo the house is a lovely simple design. Are you in a dry area? A black door would be great, it's currently charcoal. I liked what someone earlier said about chunky patio posts too. Yes, we are in a warm temperate zone - we get frost and not much water. More photos from several angles. In these you can see additional gardens since the above photos were taken, but we're willing for it to be a blank slate, I really like the idea of opening up the area in front of the patio area for some landscaping, pebbles, etc, and bounded by a partial screen, or plants, as shown in some photos offered in the comments. In the closeup you can see how the patio juts out just slightly, which really bugs me. Love the black door to match your screen and the chunky posts, it you have a second hand timer yard near by that's a cheaper option. 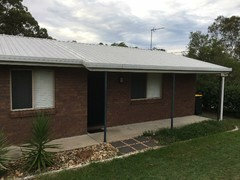 A couple of photos of a house near us that has been renovated and the other is similar to what it used to look like, you are way ahead of the un renovated house. Closeup of the patio area. Thanks @siriuskey --- totally agree about extending out at the juncture of the 'little' jut out - I'm trying to work out what would work best ... maybe chunky posts but no roof, creating a courtyard out front??? Any ideas on plants? As you can see, we were given some yukkas so have gone with that, but they do seem to be vastly overused in landscaping lately. Love free plants, actually anything free, you can make good use of these. Yes agree with chunky posts with no roof as this would make everything too dark inside. 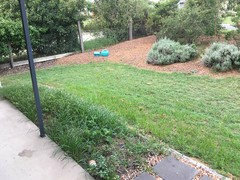 I would love to call in a landscaper @MB Designs, but the quote was $40 per m2 for design only. 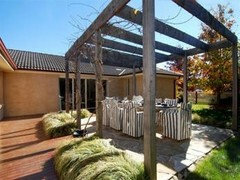 With 120m2 of front yard.... that blows the budget. 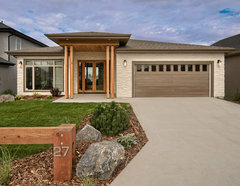 We live in a regional area and don't have a lot of choices.... luckily my Houzz community is not limited geographically. We are in regional Qld, 2 hours from the capital city. Nice Lil House on the Prairie, you have there. :) I would put a verandah all the way across in colonial style, esp if the front rooms get hot? 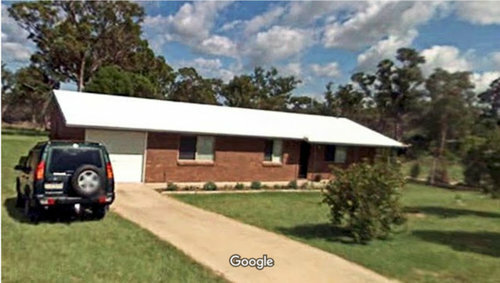 If the building line (& budget) allows, maybe a double garage in front and use the old one for a new room in the house. About 3 yrs ago, a d/gge was about $50K - maybe do it as owner builder and get quotes from a concreter, bricky and chippy etc and compare. Do yukkas transplant well? 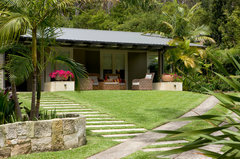 ...maybe shift 1 or 2 and put in cordylines for colour. I like the idea of the chunky timber posts. Maybe something like this? 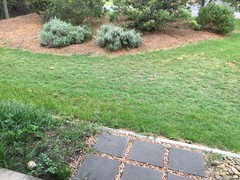 How about a native garden? Flowering gums, grasses etc. Also think some blinds on the windows facing the street could brighten things up. I'am sure is cheaper to build (minus 1 wall). Your garden has changed since the first photos, you've done some great gardening. The pebble garden across the front needs to be re planted and perhaps some stepping stones from the boundary to the front entrance. Take you photos to a local Nursery and they should be able to advise what plants to use, the Yukka's can be moved to another spot. 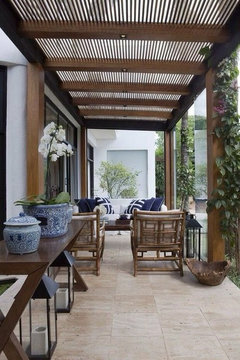 Chunkier posts, pergola along pathway with a colourful vine (boug, mandevilla or jasmine). If budget allowed it I'd spray the bricks lighter and put a narrow deck along the front too. 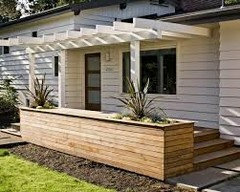 How about breaking up the front area by add a carport pergola with pergola style sides in front of the garage. 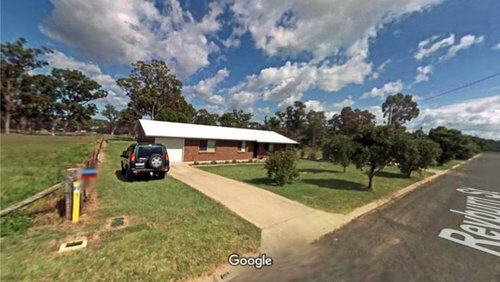 I like all the garden ideas ( it does look a bit sparse and 'rental property' look about it IMO ) , with a low fence along the front , a wooden screen a couple of metres in front of the door , etc , BUT when I looked at the very first photo -- the wider angle one -- the one thing you notice first is the yellow marker post on the left hand side of the driveway fence . So take that as a cue , and paint the garage door a bright colour to stand out -- primary or metallic or trendy , just one that you like , and personally I'd probably change the curtains ( or even dye them ) to the same colour as the garage door . Right now , everything is various derivatives of off-white and red brown earth brick -- needs a decent spot of colour to lift the houses look IMO . Another option would be 'natural' timber blinds , especially if you had them the same shade of stain as the screen and the front fence , but I'd still do the garage door ( and maybe the guttering ) your current favourite colour . Trees. Traditional, tried. tested, true. A treed "avenue" for your drive and trees to frame and border your front yard. deciduous mainly but withe carefully placed evergreen or 2 depending on site requirements. 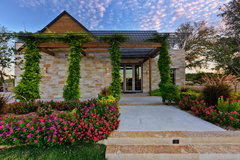 Redefine your front patio to more generous depth and plant generously beyond. 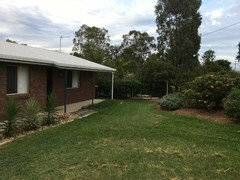 But try for a good bit of lawn near house as it will be used by young and old. Traditional. 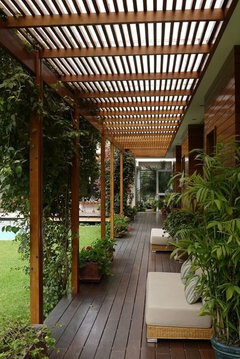 I like the ideas from siriuskey for a timber pergola with slats instead of a roof and including chunky posts and coming out about 2.5/3.0m from the existing patio roof. Replace the yuccas in the narrow garden with softer shrubs that will grow to 1.0m to hide the brickwork under the windows- I think the reason the façade looks 'bland' is that the ratio of windows to brickwork is too small. If the windows were larger, or even with the sills placed lower, the whole façade would look more pleasing. cathix you have completely confirmed and expanded my take homes at this point after all the input and ideas, on top of the ideas I had before posting. I didn't mention any of them as I wanted to give free rein to everyone's creativity - which has been awesome. Thanks so much. 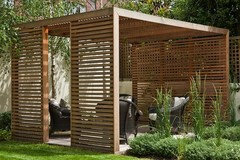 In addition, I'm going to do a vertical wooden screen (varying heights of lovely thick posts to echo the pergola) placed at the back of the garden strip, extending upwards to break up the wall of brick. Hedges either side of this should look good, but possibly retain some yukkas in front of the screen to continue the green. What should we do with this pool fence? ?